Mid-September 1944 - The Lorraine Campaign. Montgomery’s Army is to the North; American artillery is to the west; The rest of Patton’s Army is to the South. 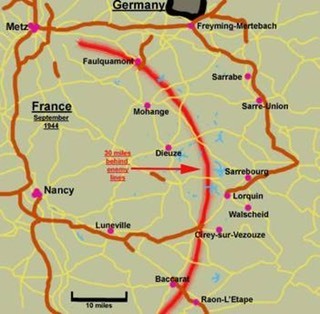 The US 3rd Army takes Nancy which is defended by units of the German 3rd Army. Scene: On a French farm near a bridge (Map Section 3), on a rainy night just before Nancy is taken, with their own mortars falling down on them, a reconnaissance platoon is doing its job. GI private Kelly is interrogating an Oberst Colonel from German Intelligence: Purpose – find the best hotel in Nancy so their unit can R&R in style. As the interrogation progresses, the allied mortars are replaced by a hail of German 88s. The situation is not looking good but they are ordered to hold. As Little Joe, the radio operator says “We’re a reconnaissance company. It’s not our job to hold the ground. That’s an infantry job. We’re supposed to go and find some place, look at it and tell you what the situation is. It Stinks! It’s wet, its cold and we’re under heavy fire!” They withdraw just as the German tanks come through the barn. Though the German Colonel is killed, Private Kelly has some unique intelligence information. Scene: Some days later, the Recon team is at a nearby farmhouse for 3 days of rest and recuperation before going back in line. Enough time for Kelly to take advantage of his private intelligence data: 14000 gold bars held by German’s in a bank 30 miles behind enemy lines. Through some special deals with Staff Sergeant Crapgame of the local US Supply depot, Kelly gains a platoon of tanks. Kelly introduces his plan to Master Sergeant Big Joe and the rest of the platoon after their Captain Maitland (who’s uncle is 2 Star General Colt) abandoned them to fly to Paris for 3 days. They start at Map Reference 473. Kelly has Master Sgt. (Friendly Fire) Mulligan of Mortars Battalion lay down a 3am barrage on a town at Grid Section 7 Crossroads just at the front. The Heroes are to plow through the same barraged town that Kelly captured German Colonel Dunkhepf. They are then to drive to a wooded hilltop (about 25 miles from Clermont) where they will bivouac for the rest of the night. The next day they are to drive to Grid Section B (a lumber building on a road bend) and rendezvous with Oddball’s Shermans at 2100 hours. That next morning their group is to pass a large bridge before the ally planes bomb it into the river. Once past the river, they are to make their way unmolested to Clermont. They then recon, find the best way in, avoid or destroy the Tigers, take the bank, leave and drive back to Nancy that night (or perhaps Switzerland as its only 100 miles away.) That’s the plan. The following campaign lets you play the story from Kelly’s drive through the mortared town at Map Reference 473 on through to Clermont. There is a great possibility of losing important characters, so if you would prefer, you could just pick a scene and fight it with characters and vehicles shown in the movie. You may make any character a STAR per Stars and Grunts on page 5 of NUTS! 2nd Edition.